KEEPING IT ON THE WILD SIDE! All of our native plant stock is nursery grown. In order to preserve the delicate balance of the environment we ask that you leave wild plants growing where you find them. Take pictures, enjoy the beauty of these plants, and leave them for others to enjoy. 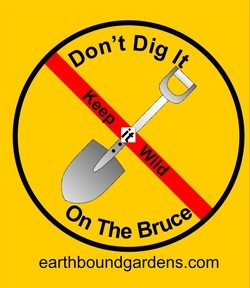 We have been saddened by the disappearance of many stands of our favorite native plants over the years and urge you to pass on the message to friends that it's not okay to remove plant material. If you want to recreate a 'wild' environment in you garden, buy nursery grown stock. We at EARTHBOUND would be happy to help you choose plants suitable to your location and help you locate plant stock.